Waze  a popular cross-platform, crowd-sourced traffic and navigation service  has been acquired by Google, and will be integrated with its Maps service, the company announced on Tuesday. Google's purchase was revealed on the company's official blog by vice president Brian McClendon, who announced that the Waze development team will remain in Israel and operate separately for the time being. The acquisition also brings in the active Waze community, which contributes data about traffic and accidents to inform other users. "We're excited about the prospect of enhancing Google Maps with some of the traffic update features provided by Waze and enhancing Waze with Google's search capabilities," McClendon said. No price was given for the acquisition, but reports from last month suggested the company could pay as much as $1 billion in a buyout. Previously, Facebook was also reportedly in Talks to buy Waze, also for an asking price of about $1 billion. As of April, Waze had more than 40 million people actively using its service and contributing data. Investors in the company include Microsoft and Kleiner Perkins Caufield & Byers. Waze is a free application available on the iOS App Store, offering turn-by-turn directions with automatic traffic data reporting. Community-generated data includes real-time routing, live maps, and an accident reporting system. Google's purchase comes as the mobile battle for mapping is heating up between it, Apple, and other major players. Apple's iOS platform relied on Google for mapping data until last year's launch of iOS 6, when Apple debuted its own Maps application. Maps was introduced on iOS, but will come to the Mac later this year with the launch of OS X Mavericks. The company has worked behind the scenes to improve its Maps service, following a perception at launch that it was vastly inferior to Google Maps. Rumors suggested early this year that Apple was interested in acquiring Waze, but those turned out to be inaccurate. 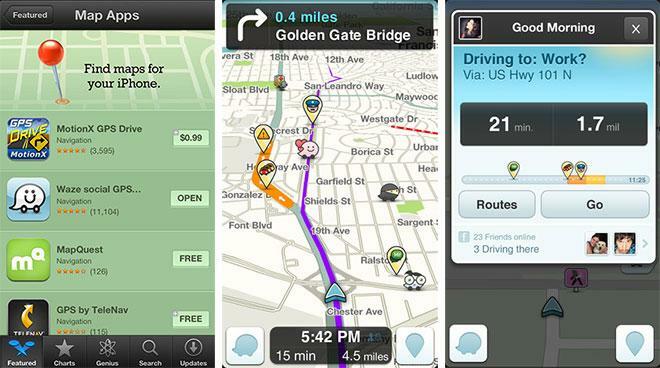 The Waze iOS application was highlighted by Apple last year following the launch of iOS 6, when the company promoted alternative mapping applications and apologized for the substandard quality of its own Maps.